Sadhana Kendra Ashram is a spiritual centre founded by Shri Chandra Swamiji Udasin in 1990. It is a place for the practice of spiritual sadhana, run by Seekers Trust, a spiritual and charitable organization founded by Swamiji in 1970. 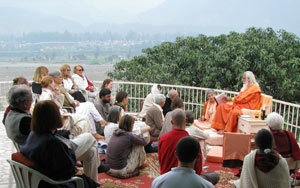 The ashram is situated on the banks of the holy Yamuna River and surrounded by the Himalayan foothills. Shri Chandra Swamiji, lovingly called Swamiji or Maharajji by his devotees, is the moving spirit behind all the activities of Sadhana Kendra Ashram, both spiritual and charitable. Having himself traversed the arduous path of spiritual sadhana and attained the highest never-waning experience of the Divine, he is a living example of balanced and right spiritual approach. Daily and regular practice of meditation is the main activity of the ashram and forms the basis of the daily schedule. Four meditation sessions are held each day throughout the year in the common meditation hall. Shri Chandra Swamiji himself attends two of the meditation sessions each day and sits with the seekers in silent meditation. 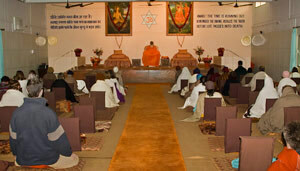 Strict attendance at the group meditation sessions is mandatory for all staying in the ashram. Part of the regular ashram routine is the daily morning satsang at 11:30 a.m., during which seekers gather around Swamiji on the open terrace and enjoy an informal time his presence. Sometimes devotees sing devotional songs and Swamiji himself often recites one or two of his favourite verses from Gurubani. Along with meditation and prayer, seva (selfless service in the name of God) is also an important part of the ashram routine. Swamiji always emphasizes the importance of integral sadhana, in which the energy of action, emotion and knowledge are all sublimated and directed towards the Divine. 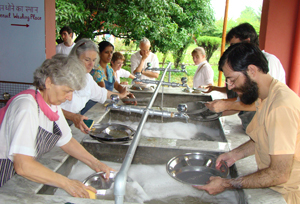 Therefore, as part of their spiritual practice, seekers staying in the ashram are also required to participate in the daily upkeep of the ashram in various ways, such as cleaning, gardening, chopping vegetables, etc. Those who are fit and able are expected to contribute a minimum of two hours daily to selfless service in addition to attending the four daily meditation sessions.